Its the beginning of silly season in plus size fashion. New collections, promotions and a general ramping up of fashion in general after a fairly sedate start to the year. This means I will be spending a lot of time in London which also means a lot of time on trains, pounding the streets, jumping tubes and generally being on the move. Staying cool and stylish whilst contending with someones armpit in your face (you have gotta love that underground) is always a bit of a challenge so I thought I would share the outfit I wore to the big smoke earlier this week. It served me rather well indeed and shows that tailored lines can work really well on a soft round body. 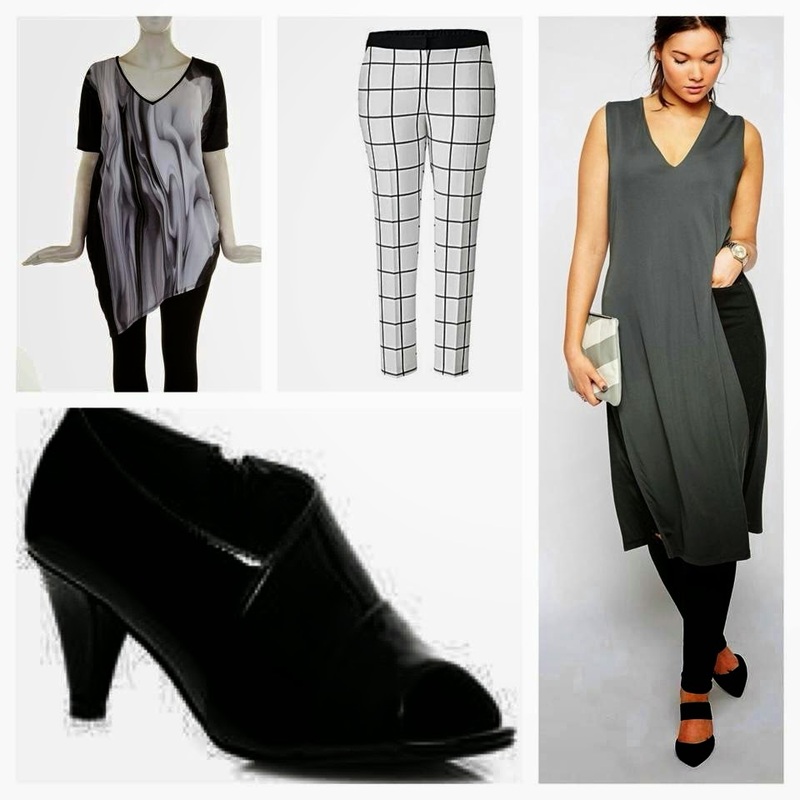 I fell in love with these monochrome check cigarette trousers by Simply be as soon as I saw them. I love a cigarette pant but always worry that without a pair of heels they can end up looking a bit half and half, not a skinny jean, not a legging but these really work even paired with a pair of trainers. I am having a bit of a Rupert the bear moment trouser wise and there is a white pair like this featuring a black stripe which I have also got my eye on.I just love the cut. My Black Nike airs are such a joy for days when I am standing or walking all day. I can manage wedges in the day but even kitten heels leave me hobbled after a few hours so these are perfecto. My loose fitted knotted long sleeved tee in grey marl also by Simply be was a bit of a gamble as I wasn't sure how much I would like the knot at the front. Turns out I absolutely love it. yet again its such a great shape,slightly longer than the average tee shirt so isn't cupping my VBO in a vaguely protective manner but skims over it giving me a much neater line. My navy linen jacket is by Yours. Its in crisp navy with a contrasting polka dot lining and is fast replacing my black leather jacket as something I can chuck on with almost anything. Its such a good wardrobe staple and instantly feels chic and vaguely androgynous which given that I'm usually wearing false eyelashes and a lot of hair is wonderfully contradictory-standard. Based in Teddington They create jewellery using old watch parts, vintage crystal and small engineering components, melted glass, vintage toys and a range of other unlikely materials.which sounds a bit mad but as you can see their stuff is beautiful. They also create clothes using hand dying techniques and designs based on found objects. I've got a fab top from them which I wore the other night to meet Tess Munster (post coming soon) which is so good. If you like plus size fashion and want to see more then hop on over to my Plus size fashion page Its jam packed with beautiful clothes all reviewed by little ole me. And while I'm in an informative mood you know you can follow this blog via bloglovin Fat Fresh Fashion delivered hot to your inbox.